THE businessmen behind Sevenoaks’ first sushi restaurant are ditching raw fish in favour of burgers, steaks, fajitas… and wall-to-wall sports coverage. Seven Sushi in London Road is undergoing a major makeover to become a Tex-Mex sports bar in time for the World Cup. 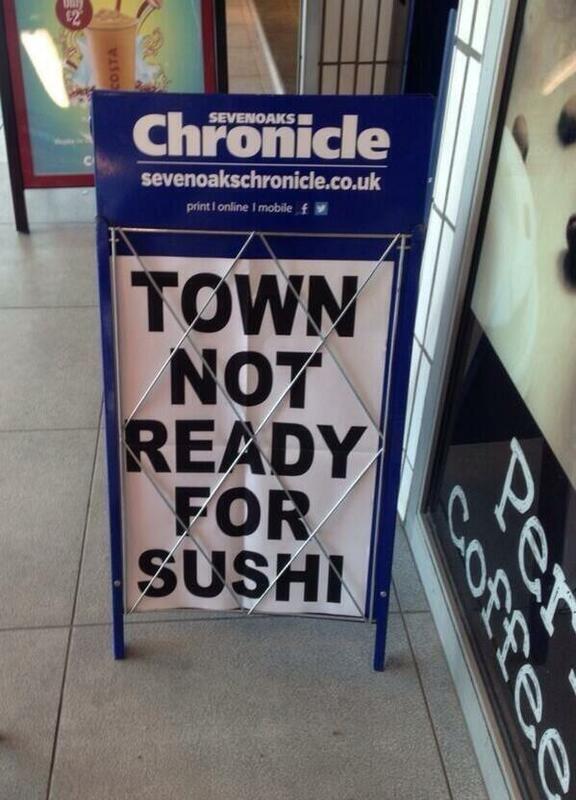 Its owners say they called time on their Japanese menu after just six months of trading because sushi has not proved as popular in Sevenoaks as they had anticipated. Director Hugo Peyrel said: “Seven was a high-end sushi experience but, with hindsight, it was more a London offering than Sevenoaks. Treat “It’s not everyday dining – it’s a very occasional treat. “Sushi is also expensive when it’s prepared fresh and to a high standard. And it’s not a taste that’s for everyone. “We had a lot of praise for our food and we did have a regular clientele. “But as time went on, we felt we weren’t getting the response we had forecast.” Mr Peyrel, who also runs El Matador across the road, said his company had initially toyed with the idea of launching a Tex-Mex restaurant when it bought the old Lady Boswell’s School building last year. Now, with the sushi trade not panning out as planned, his team is going with its initial instincts. “Tex-Mex appeals to a much wider clientele,” he said. “El Matador has been established for three years and food at this new restaurant will be a lot closer to the Spanish and South American styles of cooking we excel at. “We’ll be offering Texan favourites like burgers and steaks alongside Mexican dishes with a twist. “We are also creating an American-style sports bar. Sevenoaks is lacking a good sports bar. We’ll have four or five big screens and we’re doing promotions with beer companies like Coors, Miller and Heineken. “We think the sports bar is exactly what Sevenoaks needs, especially this year with the World Cup. That’s why we’re planning to open early next month – just before the warm-ups.” The new restaurant and sports bar will be called Border Tex-Mex and starts trading on June 9. St Albans – Cafe Society or Charity Shop Society? More we dont like your coffee nonsense, this time in St Alban’s, On the Nero research though there is a dependent independent variable issue – like upmarket pizza chains coffee chains will be spatially autocorrelated with locations where there is strong ABC1 footfall. They don’t necessarily cause that footfall, they reflect it. Campaigners are hoping councillors will wake up and smell the coffee when they decide whether or not to give Caffe Nero planning permission for a city centre outlet tonight (Tuesday). Planning officers are recommending that permission should be granted for the coffee chain to change the use of the former Monsoon clothing store, a Grade II listed building in Market Place, St Albans. But Marion Hammant, who has led the campaign to persuade the council that there are already too many coffee chains in the city, is hopeful that councillors on the planning committee central will take the opposing view at tonight’s meeting. Marion, who is backed by St Albans Civic Society, believes that St Albans is saturated with coffee chains which damage local independent cafés and retailers. She has received plenty of support for her campaign against the Caffe Nero application which has attracted nearly 200 objections to the council. They cite a number of reasons why the Caffe Nero bid should be refused including over-saturation of coffee shops, loss of character in the city centre, the impact on local coffee shops and the homogenisation of the city centre which could affect visitor numbers. But planning officers maintain that the proposal is an appropriate use for the building and would contribute to the vitality and viability of the city centre. They see it as preferable to the building standing empty and refer to research put forward by the applicants, Nero Holdings Ltd, that coffee shops improve the local economy of High Streets by three to five per cent. Marion said there was ‘a degree of passion’ about the issue and said the leaflet she and others had put out around the town bore the words ‘Oh no, not another one’ as its top line. And she called on councillors voting on the issue to have the ‘courage to say we don’t want this’. Speaking to the BBC after the local elections, Labour Leader of Hammersmith and Fulham Stephen Cowan, said that some planned developments in the area would now be scrapped – although he wouldn’t reveal which ones. The first phase of the Earls Court scheme designed by Kohn Pedersen Fox (KPF), Terry Farrell Architects and Pilbrow & Partners, had been given planning permission back in April 2014 and includes the demolition of two estates and the Earls Court Exhibition Centre. Prior to the election Labour councillors had been in discussion with local residents against the demolition of the surrounding estates and had issued a manifesto pledging to take immediate measures to protect homes. Farrell’s wider masterplan includes 7,500 new homes, of which 1,500 will be affordable, and a £452million package of benefits for the local community including £44million earmarked for local transport infrastructure and £36million for local school, health, community and cultural space provision. A spokesperson for the developer CapCo commented: ‘We look forward to working with the new administration in the period ahead. Detailed design proposals for further phases of the Earls Court Masterplan will be presented for consultation in late 2014. But they wont have a choice will they as the extra homes in the masterplan are now in the London Plan, and because of changes in the last budget H&F will e forced to intensify existing estates if they want to build new affordable housing. I will bet that after a year or two hiatus the plans will be back. I used to do a lot of big sites work in H&F. It was clear in the labour days that the priority was not to maximise affordable housing but top maximise the % of affordable to manipulate voting roles, and when the conservatives took over they had learned a good lesson as their priority was exactly the opposite. The Earls court scheme is controversial, but if London is to meet anything like its housing needs it needs 20 or 30 similar schemes, from Bermondsey to Lambeth, from Finsbury Park to the Lea Valley. If Labour try and block it it will give Boris just the ammo he needs to declare a mayoral development corporation/housebuilding zone and shut the locals out. Earls Court could be London’s Hammarby Sjostad, and just like that area was opposed by exactly the same kind of misconceived campaigners. The same kind of people that show groups of visiting urbanists around such areas claiming it was their idea all along. Yes we need more housing and more land for housing as shortage of land for housing is one of the main causes of the UK Housing Crisis. We here every day in the media further calls to ‘relax planning’ at ever increasing signs of a housing bubble, especially in London and the South East, where year on year house price increases in some areas are over 20%, levels which historically are signs of an impending crash. Yet planning has been relaxed to unprecedented levels. Other than printing planning permissions at random in random locations and mailing them to citizens (pretty much Alex ‘Half Baked’ Mortons current plan) it is difficult to see what more could be done. The current ‘liberalisation’ of planning has created civil war in the countryside, has decreased land allocated for housing, has increased time taken to adopt local plans, has reduced the proportion of local planning authorities with 5 year housing supplies, has increased the number of out of date local plans and created the biggest gap between the rate of household formation and rate of land being allocated for housing ever seen. All the opposite of the intended consequence. Clearly and unambiguously the NPPF has failed on every possible metric that Gregg Clark the minister at the time said it would succeed on, other than the number of yet to start consents housebuilders, and ‘shadow housebuilders’ like Gladmans (which don’t even appear in HBFs landbank stats) have on their books (and a very dangerous stockpile that is as we shall see). This reality on the ground rarely commented on by broadsheet economic scribblers like Allister Heath is part of the reason why their narrative of ‘relax planning’ is so off the mark. The conventional neoclassical narrative is that ‘demand’ is greater than ‘supply’ so simple – increase supply. Lets put this more accurately ‘demand – fueled by rational speculation and irrational price expectation is greater than ‘supply’- fuelled by rational speculation and irrational price expectation – at that price level, where a range of price levels are fuelled by irrational speculation and/or irrational price expectations. This is an adaptation of the circuitist view of the credit cycle pioneered by Professor Steve Keen (now Economics Professor at Kingston) and others with rather inconveniently fits the historical evidence. Seen within this view the amount of ‘effectual demand’ within a market (put simply without government) is a combination of income spent (velocity of consumption)+change in consumer credit+change of consumer savings spent +inflow of spending from abroad, and ‘effectual supply’ is a combination of revenues spent of production (velocity of production) + change in producer credit +change of business savings spent +inflow of spending from abroad. You can complicate this further through accounting for a secondary circuit of rentier income (which Piketty focuses on ) , government spending and borrowing etc. but for the sake of this argument lets keep it simple. Credit is sucking effectual demand from the future to now on the expectation that the cost of the credit will be more than offset by the increase in profit on the asset. Savings are taking effectual demand from the past to now on the expectation that the opportunity cost of the savings will be more than offset by the increase in profit on the asset. Inflows of demand from abroad occur when the opportunity profits of asset purchases abroad will be more than offset by the increase in profit on the asset. By ‘rational speculation’ I mean speculation which helps market discovery and liquidity and so helps prices achieve at least ‘partial equilibrium’ levels where supply=demand in that market. ‘Irrational’ behavior is where the NPV of the servicing price of the spending on the asset (including interest on credit) is greater than the fundamental price of the asset (such as for housing the NPV of the rental stream). Irrational behavior can include irrational speculation, but it also includes other irrational expectations as bubbles and busts have been observed in markets where speculation is impossible. The trouble is its almost impossible to tell when speculation is rational or not – if you could you’d be richer than Warren Buffet. The key here is that irrational behavior occurs on both the consumer and producer sides of the balance sheet and action on one side only can sometimes only make matters worse. For example more land becoming available towards the top of a bubble might simple encourage more people to take out credit to support a house price at unsustainable levels if there have previously been in a ‘queue’ for a suitable property. Similarly a landowner or developer might simply increase their inventory of unsold stock on the expectation of increased prices tomorrow, prices fulled by the increase in consumer credit. Exactly the kind of disequilibrium behavior you would expect from options theory. The rise in prices leads to increased book value of housebuilders and non building shadow housebuilders landbanks leading them to borrow more to buy land (pushing up prices). The increase in bank profits from more lending on a rising market leads their ‘charter value’ to increase enabling them to create money via credit to lend more to producers and consumers fuelling the credit cycle. Other than in the unlikely event of macroprudeetial measures achieving a ‘soft landing’ , or the past Chinese solution of ever further government liquidity creation to put off the dirty day, there is only one place to go, credit fueled boom, and if large enough, a balance sheet recession at the end. So if the market is near its peak supply side measures such as relaxing planning can make matters worse. Planning is a medium-long term measures. By all means increase supply, as a long term well planned and rational way looking at a horizon of 10, 15, 20, 30 years through Garden Cities and other measures, not in a crazy rush which may simply pop the bubble and leave house builders like in 2009/10 with a massive burden of landbanks the debts of which they cannot service and which will drag down house-building levels to historically low levels. Havent we been there before with Brown’s buetiful timing in implmenting the Barker Review 5 years after those measures would have been well timed. All the love ion the world to our friends at Planning Resource. The Russian Army has withdrawn from the Ukraine border, reports say. Cable Build Garden Cities on Green Belt – Clegg Build Garden Cities Beyond Green Belt – Who is Right? Vince Cable said difficult decisions needed to be made about building garden cities on green belt land, and that proposals to reduce demand by paring back government’s Help to Buy scheme missed the bigger problem of a lack of supply. Cable has long warned about house price inflation, but his latest remarks are his most serious yet, and reflect frustration at the way in which David Cameron’s reforms to planning laws have done little to unleash supply. He told ITV news: “There is an enormous gap between what’s needed, which is probably 300,000 houses a year as my party is advocating, and what we’re currently getting, which is 125,000 to 130,000. We are way short on the housing supply which is needed. “We are in future going to have to take tough decisions about using green belt areas for new planned cities, garden cities for example,” he said. Cable is, if you had to choose, but both are right. Although the primary purpose of Garden Cities is to build housing beyond the Green Belt saving unnecessary loss of Green Belt, the Green Belt in some areas, notably the metropolitan Green Belt around London, has grown so large that without massive infrastructure investment in rail, which will take 15 years to deliver, some Green Belt loss is inevita;e if housing need in teh SE is to be met within a reasonable timescale. I’m talking about the mid term 10+ years as Garden Cities and strategic sites cant be buiolt over night. We are talking about reducing the next housing bubble after the next housing bubble. I think any housing planner in the South East who has done the number knows this but would only admit it is a room totally out of earshot of any politicians who employ them. Cheshire East Council is to seek a judicial review over the planning inspectorate’s decision in April to approve an application from Rowland Homes for a 96-home development at Elworth Hall Farm. In the appeal decision letter dated 11 April, the planning inspector identified issues with the council’s proposed pipeline of housing, pointing out that 40% of houses assumed to be delivered within five years do not have planning permission. The document also said that “their early development is by no means a certainty” and that “significant infrastructure requirements will undoubtedly cause delays”. Cllr Michael Jones, leader of Cheshire East Council, said: “This was a very important planning decision, which was produced in a way which left many members of the public concerned. In December, Cheshire East served papers in the High Court challenging the planning inspector’s decision to approve Seddon Homes and Taylor Wimpey’s joint development of 160 homes at Congleton Road in Sandbach. The Council’s appeal was dismissed by the High Court yesterday. David Cameron’s own election agent and one of his ministers are fighting plans to build more than 100,000 new homes in near his Oxfordshire constituency. The protests have emerged after the Prime Minister said that local Tory-run councils do not have a “not-in-my-back-yard” view towards development. Mr Cameron told BBC Radio Four on Tuesday that he did not “accept” that Conservative-led councils had a Nimby view towards new house building. He said: “We have a locally-driven planning system where the first decision is made by the local district council. However it emerged that Conservative leaders of four local councils – including West Oxfordshire which is run by Barry Norton, Mr Cameron’s agent – are concerned about a new forecast for 100,000 new homes in the area over the next two decades. The report recommended that up to 106,560 additional homes – or between 4,600 and 5,30 homes a year – are needed across Oxfordshire between 2011 and 2031. The report – published in March – replaced previous forecasts which said only 55,200 new homes were needed between 2006 and 2026. Mr Norton, the West Oxfordshire leader, told the Oxford Mail that the forecast – which will force his area to build 660 new homes a year – was “wrong”. A West Oxfordshire spokesman added that Mr Norton and his fellow councillors “will decide locally an appropriate housing target figure for inclusion in the final version of the Local Plan which will then be tested through public examination”. Three other local council leaders also said they were concerned about the forecasts – which are 40,000 bigger than previous estimates. The row has escalated after Ed Vaizey, a friend of Mr Cameron and the MP for Wantage and Didcot, complained to Nick Boles, the planning minister. He added: “I am in no doubt that more houses are needed in this area. However there is concern that the standard national methodology that has led to these numbers is over-estimating the actual demand locally. In his reply on May 15, Mr Boles said that “the Oxfordshire authorities should be applauded for the proactive and co-ordinated approach they have taken”. He made clear that the forecast for 100,000 homes did not account for local planning constraints, suggesting that the figure might decrease. Local plans – which under planning guidance published in 2012 set out where building has to take place for five years – included green belt protections. Shaun Spiers, the head of the Campaign to Protect Rural England, said Mr Cameron should be looking to build on brownfield sites not the “green fields of Oxfordshire”. If anyone has the boles letter to Vaizey please send it. Is Boles suggesting that constraints in Oxfordshire meean that the demand should be met in Northants and South Warwickshire – because of course Government Policy rightly says need should be met in full. Is 100,o000 homes for Oxfordshire realistic and deliverable? Of course it is thats what Garden Cities are for. Anchorman has said in public forums when questioned about the success of the ‘duty to cooperate’ that some areas are making it work. What areas can he have in mid? Well of course there are the many areas that are doing joint plans but I think he had especially in mind the wider areas that have undertaken some kind of joint arrangement to coordinate strategic planning and especially set up structures to agree housing numbers following a joint SHMA. One thinks of for example PUSH, Sussex Coast, Greater Cambridge and now (formerly one of the worst offenders) Herts. Agreeing joint arrangements in these areas has not been easy, as I know from experience in advising on setting several of them up. In particular having some kind of leaders forum does not mean there is any kind of governance structure for deciding housing numbers. In many cases these numbers have not been tested yet and failure to test alternative distributions from the SHMA and consult on them cross border may be found to fall foul of the SEA directive. But it is a good deal better than those areas like Bedfordshire where authorities continue to fight like rats in the sack, with misaligned pre and post NPPF / RSS revocation adopted local plans and no incentive to cooperate, or Greater Nottingham with its go it alone landing in a trainwreck. Even those areas with joint plans or joint numbers have struggled to keep pace with updating numbers in a post RSS world and a government that gives no breathing space to update these with the latest demographics. What the areas making a hash of it are creating. Joint evidence base, leading to allocation of housing numbers pan authority at roughly county level to be tested at examination. Ask any first year planning student in the 70s or 80s what you called that – all hands would pop up – structure plans. “I think we are all well aware [the D TC is] not working at all well. Will it be replaced? Well the DTC is working as we have said on here many times, just in geological time, if you ignore your neighbours, or just set up a forum which takes minutes but does no planning you will fail, and those authorities, as for example East Cambridgeshire, will come on board. It just takes years for reality to hiot home to tye council leaders in question and chief officers fearful of their jobs in an age of austerity have been reluctant to give them robust advice. If it were abolished it wopuld send the wrong signal – like you no longer need to cooperate. Whatever you thought about ‘top down planning’ abolishing RSS sent exactly that wrongt signal and led to 3 lost years in planning and a collpase in housing allocations. The DTC however was always a backstop power for a lack of strategic planning. Even if strategic planning makes a come back, eventually after 20 years of the DTC you might see nationwide coverage of strategic planning SHMA partnerships, you would need the DTC to cover those cases like Harlow that span the borders. But if the wind is blowing in the direction of housing market area partnerships dishing out the numbers surely we can get there more quickly. Labour seems to be thinking in this direction but seems reluctant to announce pre election. Even without statutory reform if this is the inevitable direction of change why not flag it. A big speech can make a lot of difference in planning. So why does not Anchorman or boles make one – it would save everyone a lot of headache and bring reality home to the head in the sand council leaders.